very good.I translate this theme for persians. Amazing. You deserve a medal for best WordPress theme of the year. One quick note: There is no associated PSD file included in the download. How can I go about getting them? Thanks!!! Very grateful to you as you have shared the above listed themes free of cost! Beautiful theme – thank you. 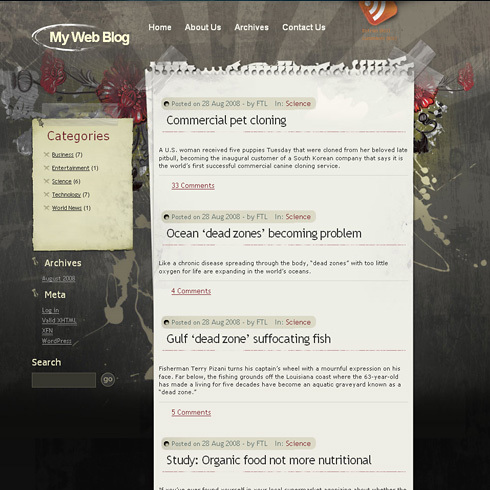 im currently using this theme on blogger and it works well except for the date of the blog post. I mean the date is not showing it only says undefined..
G R E A T !!!!!!!! Thanks for the great Theme!!! I like it especially its for free 🙂 Thanks thanks..
4 ????????????? ??????? ??? Wordpress | ????? ??? ??? ???? ?